There is such an abundance of dental hygiene products available nowadays, that many people struggle to decide on which products are best for them. Many people believe that electric toothbrushes are better than manual brushes, but is there any truth in their belief? Dentists will often tell their patients that the most important thing where tooth-brushing is concerned is to brush two times a day, the most important time being before bed, and to brush for at least 2 minutes at a time. This can, of course, be achieved whether you are using a manual brush or an electric brush, so does using an electric toothbrush have any advantages over a manual brush? Well, most electric toothbrushes come with a built-in timer, which makes the user aware of how long they’ve been brushing their teeth for, unlike manual brushes. This can be particularly useful where children are concerned, however, using an egg timer or playing a 2-minute-long song while brushing, is always an alternative option, but it isn’t always convenient – especially with a tired and ratty child…or parent! Many people are guilty of brushing too hard, which can, over time, cause irreversible damage to tooth enamel and can cause receding gums, which is also irreversible. Most electric toothbrushes have a sensor, which then emits a coloured light when too much pressure is being applied, notifying the user to brush more gently. However, those who choose to use a manual toothbrush, can either consciously make the effort to brush gently, or, they can use their less dominant hand to hold their toothbrush; which usually results in less pressure being applied, unfortunately, using the less dominant hand can also result in less effective brushing, because small, specific movements are harder to achieve with less dexterity. There are several recognised effective tooth-brushing techniques out there, but most dental professionals recommend something called the ‘Modified Bass Technique’, which involves moving the brush over each tooth surface in small circles at a 45-degree angle, this helps to remove plaque and food debris, and gently massages the gums at the same time. Obviously, this is possible with a manual brush, but it takes far less effort with an electric brush that has an oscillating head. Reaching awkward areas in your mouth with your toothbrush can mean that these areas are missed when brushing on a regular basis, which can lead to plaque accumulation, calculus (tartar) build up and food stagnation, none of which are good for maintaining good oral health or for fresh breath. If you use a small headed electric toothbrush, such as an Oral-B, round, oscillating head, reaching these awkward areas can be easier, particularly areas at the back of your mouth, but there are techniques that can help with this problem if you use a manual toothbrush. Closing your mouth slightly when brushing your back teeth on the top jaw allows the cheek to relax and provides more room for your toothbrush for example, and of course, using disclosing tablets; which use a dye to show where plaque is present in your mouth, can help to make sure certain areas aren’t being missed when brushing. For those who have dexterity problems, such as children (who should be supervised when tooth-brushing until at least the age of 9), or people who suffer with medical conditions like arthritis or Parkinson’s, or people who have lost dexterity as a result of a stroke, holding a toothbrush, never mind controlling its movement, can be difficult. There are options available for both manual and electric brushes where the handles are bulkier, which helps to hold the brush, but achieving the specific small movements required for good tooth-brushing can still be difficult with a manual brush. Electric toothbrushes allow the user to let the toothbrush do the work for them, so long as they are moved around the mouth, along each surface of each tooth, effective tooth-brushing can be achieved, even with poor dexterity. 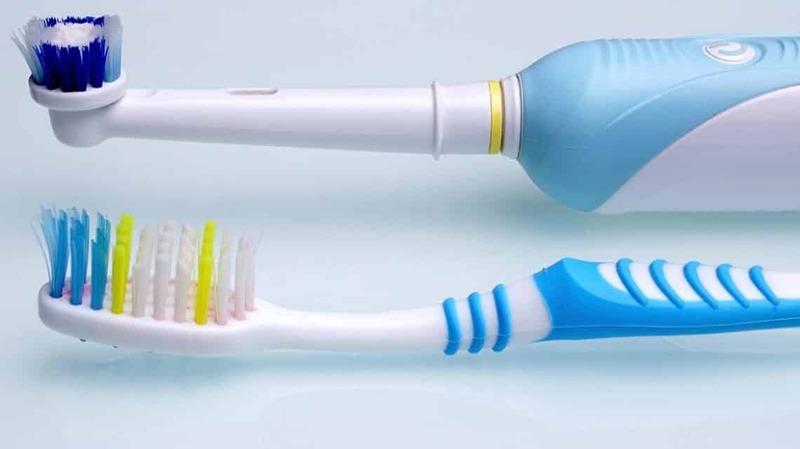 In conclusion, good and effective tooth-brushing is possible with both manual and electric toothbrushes, but electric toothbrushes do tend to take the hard work out good tooth-brushing. Manual brushes are obviously cheaper than electric brushes, but thankfully these have become more affordable over the years and you can usually find a good electric toothbrush for under £30, plus you don’t have to replace the whole brush every 3 months, like dentists recommend, but only the toothbrush head. The only downside to electric toothbrushes, aside from cost, where some people are concerned, is that you must keep your toothbrush charged, but in an era of electronic gadgets such as mobile phones and tablets, surely this is a part of everyday life for most? It’s obviously important to avoid high sugar diets and to visit your dentist and dental hygienist on a regular basis but as far as tooth-brushing is concerned, the important thing to remember, whatever type of toothbrush you choose to use, is to do as your dentist says and brush your teeth twice a day for at least two minutes, most importantly before bed. Still unsure what to do? Head over to our Facebook page and send us a quick message, one of our senior oral health professionals will be happy to discuss what is going to be best for you!